To be honest, this recipe is far more Russian than French. It was passed along to me by a Russian friend who had learned it from her mother, and she from her mother, and so on. As I have never made the dish anywhere but Paris, for me it qualifies as French too. The technique harks back to olden days and may seem a bit bizarre at first glance. But if you follow the instructions to the letter, your success is guaranteed. One word of warning: do not attempt this recipe with frozen fish. Only the freshest salmon will do. Have the fishmonger cut a thick fillet and remove the bottom skin if at all possible. If not, your first step at home will be to remove the skin using a very sharp knife. In a small bowl, mix the salt and sugar together. Rub the mixture onto the salmon, covering all surfaces. Wrap the fish tightly in plastic film. Dampen a dish towel, wring out well and wrap it around the fish. Place on a plate and leave at room temperature for 24 hours. Make sure the dish towel remains damp. The next day remove the fish from towel and plastic film. The salmon will now keep for several days. If you will not be serving it immediately, cover with foil and refrigerate. 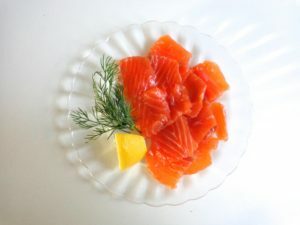 To serve, slice thinly and place on a platter or individual plates, garnished with dill and a wedge of lemon. Gravalax, French-Russian style, is generally served as a starter. The salmon may be accompanied by blini (small yeasty pancakes) and crème fraîche or sour cream, or served with warm toast and butter, or just as is. To give the dish a Russian flavor, serve it with chilled vodka. For a French touch, serve it with Champagne or a great white wine, for example a Pouilly-Fuissé or a Meursault.